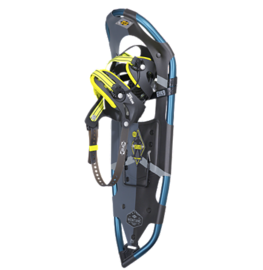 Unlock a new level of technical fun this winter with the new Atlas Montane snowshoe rental package from OER. 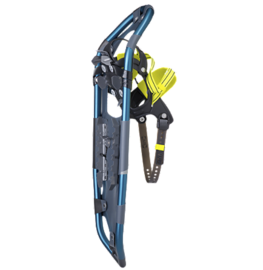 Our snowshoe rental package includes the state of the art Atlas Montane snowshoes and a pair of poles. The Atlas Montane is perfect for the steep trails in the Catskills and Adirondacks! 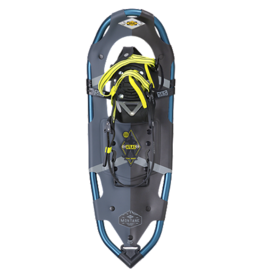 OER’s showshoe rental packages feature the new Atlas Montane men’s snowshoe was designed to handle variable mountainous terrain. The essential strength of our V-Frame™ design and time-tested Spring-Loaded™ Suspension system provides a sturdy and versatile platform for the Montane’s comfortable, precision-fit Wrapp™ Swift binding, with the added bonus of heel lift bar to ease calf strain. Don’t let a steep summit turn you around – keep going on the Atlas Montane. The sharp ridges of the side rails augment the downhill function of the heel cleat, running parallel to the snowshoe frame for solid footing, even on firm sidehill terrain. The time-tested geometry of the All-Trac™ toe crampon provides traction in all directions. Wider traction tabs on the sides and corners complement sharp front and rear points for confident hiking. A proprietary Atlas shape, thesturdy aluminum V-Frames are the key to an efficient, natural stride. The V shape tracks straight in deep snow, and the tapered tail pulls less snow as you step forward, saving your energy. The turned-up tail of the V-frame rolls easily into each step for a natural gait. 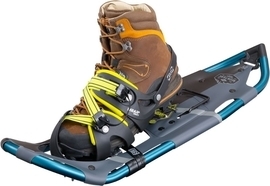 An Atlas tenet from the beginning, Atlas’ patented Spring-Loaded™ Suspension (SLS) keeps the snowshoe close underfoot for easy maneuvering and suspends your foot so it can move freely with its intended articulation. The suspension absorbs impact and lets your foot flex naturally side-to-side for a comfortable, stable position on traverses and uneven terrain. SLS enhances traction control too, as the flex provides deeper crampon penetration into the slope, especially on steep or off-angle terrain.